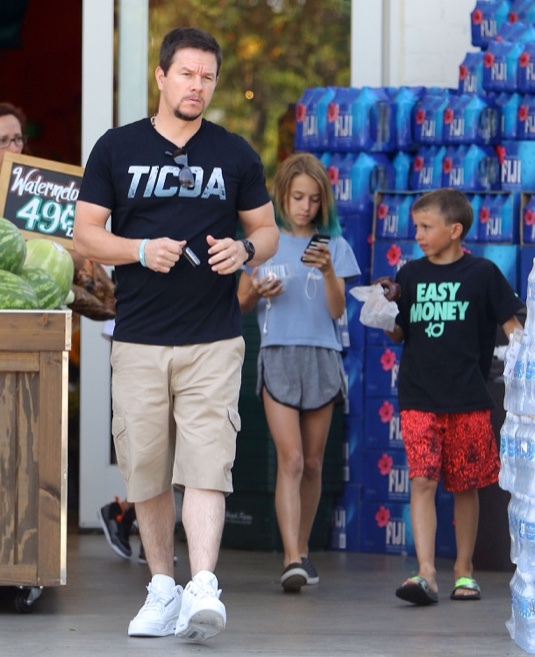 Mark Wahlberg was seen stopping by Bristol Farms in West Hollywood, CA to stock up on 4th of July supplies with his children Ella and Brendan on Friday (July 3). The Ted 2 actor was dressed in a black shirt, khaki shorts and white hightop running shoes. He walked to his car while Brendan followed behind munching on a snack. Ella typed on her phone. Wahlberg recently spoke to Men’s Health magazine about how his successful acting career has changed his life. Wahlberg is married to former model Rhea Durham. Besides Brendan and Ella they’re also parents to Michael and Grace.